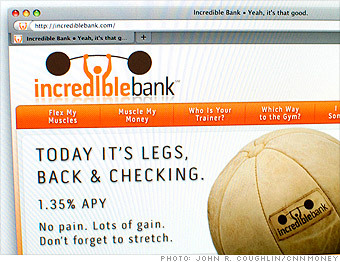 This Internet bank's mission is "to crush the puny interest rates offered by most other online banks," according to its website. Its Incredible high-yield checking account currently pays a 1.35% APY. "If you go with interest checking at major banks, they are rarely a good deal -- you'll be lucky to get about 0.25% and then you're hit with monthly fees," said Ken Tumin, founder of Depositaccounts.com. "Rates at Internet banks definitely tend to be a lot higher and you often don't have to worry about monthly fees." Incredible Bank's checking account is free unless you request paper statements. There are no ATM fees, and the bank reimburses customers for charges incurred when using other other banks' ATMs. But, like many of the other Internet banks, you have to mail in checks or make inter-bank transfers if you want to deposit money.